Quantum Limit.com: DIY submarine success! 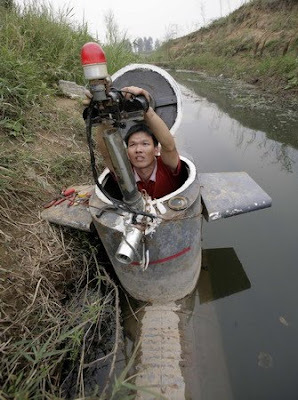 Last year I wrote about Mr Tao Xiangl, a Chinese farmer/inventor who was building himself a submarine from old oil barrels and other recycled material. To my astonishment the submarine has sailed and the brave submariner has survived the experience. Happy submarining Mr Xiangl !